"Uvula" redirects here. For other uses, see Uvula of cerebellum and Uvula of urinary bladder. The palatine uvula, usually referred to as simply the uvula /ˈjuːvjʊlə/, is a conic projection from the posterior edge of the middle of the soft palate, composed of connective tissue containing a number of racemose glands, and some muscular fibers (musculus uvulae). It also contains a large number of serous glands that produce a lot of thin saliva. The musculus uvulae, which lies entirely within the uvula, shortens and broadens the uvula. This changes the contour of the posterior part of the soft palate. This change in contour allows the soft palate to adapt closely to the posterior pharyngeal wall to help close the nasopharynx during swallowing. It is innervated by the pharyngeal branch of the vagus nerve (cranial nerve X). Uvula wiggling back and forth. This is caused by exhaling. This is also how the uvular R trill is done if it vibrates on the back of the tongue. A bifid or bifurcated uvula is a split or cleft uvula. Newborns with cleft palate often also have a split uvula. The bifid uvula results from incomplete fusion of the palatine shelves but it is considered only a slight form of clefting. Bifid uvulas have less muscle in them than a normal uvula, which may cause recurring problems with middle ear infections. While swallowing, the soft palate is pushed backwards, preventing food and drink from entering the nasal cavity. If the soft palate cannot touch the back of the throat while swallowing, food and drink can enter the nasal cavity. Splitting of the uvula occurs infrequently but is the most common form of mouth and nose area cleavage among newborns. Bifid uvula occurs in about 2% of the general population, although some populations may have a high incidence, such as Native Americans who have a 10% rate. Bifid uvula is a common symptom of the rare genetic syndrome Loeys–Dietz syndrome, which is associated with an increased risk of aortic aneurysm. During swallowing, the soft palate and the uvula move together to close off the nasopharynx, and prevent food from entering the nasal cavity. It has also been proposed that the large amounts of thin saliva produced by the uvula serves to keep the throat well lubricated. Stimulation of the uvula causes the gag reflex to initiate. This is often an issue for people with uvula piercings, and a common method of inducing vomiting. In a small number of people, the uvula does not close properly against the back of the throat, causing a condition known as velopharyngeal insufficiency or VPI. This causes "nasal" (or more properly "hyper-nasal") speech, where extra air comes down the nose, and the speaker is unable to say certain consonants, such as pronouncing 'b' like 'm'. The uvula can also contribute to snoring or heavy breathing during sleep; having an elongated uvula can cause vibrations that lead to snoring. In some cases this can lead to sleep apnea, which may be treated by removal of the uvula or part of it if necessary, an operation known as uvulopalatopharyngoplasty (commonly referred to as UPPP, or UP3). However, this operation can also cause sleep apnea if scar tissue forms and the airspace in the velopharynx is decreased. The success of UPPP as a treatment for sleep apnea is unknown, but some research has shown 40–60% effectiveness in reducing symptoms. Typically apnea subsides for the short term, but returns over the medium to long term, and sometimes is worse than it was before the UPPP. During swallowing, the soft palate and the uvula move superiorly to close off the nasopharynx, preventing food from entering the nasal cavity. When this process fails, the result is called nasal regurgitation. It is common in people with VPI, the myositides, and neuromuscular disease. Regurgitation of fluids in this way may also occur if a particularly high volume of liquid is regurgitated, or during vigorous coughing, for example being caused by the accidental inhalation of water. Due to the action of coughing preventing the uvula from blocking the nasopharynx, liquid may be expelled back through the nose. At times, the mucous membrane around the uvula may swell, causing the uvula to expand 3–5 times its normal size. 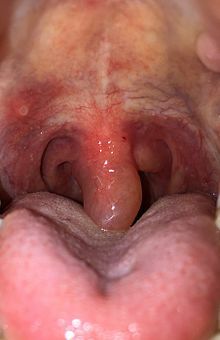 This condition is known as uvulitis. 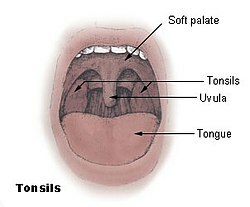 When the uvula touches the throat or tongue, it can cause sensations like gagging or choking, although there is no foreign matter present. This can cause problems with breathing, talking, and eating. There are many theories about what causes the uvula to swell, including dehydration (e.g. from arid weather); excessive smoking or other inhaled irritants; snoring; allergic reaction; or a viral or bacterial infection. An aphthous ulcer which has formed on the uvula can also cause swelling and discomfort. If the swelling is caused by dehydration, drinking fluids may improve the condition. If the cause is a bacterial infection, gargling salt water may help. However, it can also be a sign of other problems. Some people with a history of recurring uvulitis carry an epinephrine autoinjector to counteract symptoms of an attack. A swollen uvula is not normally life-threatening and subsides in a short time, typically within a day. In some parts of Africa, including Ethiopia and Eritrea, the uvula or a section of it is ritually removed by a traditional healer. In this case, the uvula may be noticeably shortened. It is not thought to contribute to velopharyngeal inadequacy, except in cases where the tonsils have also been removed. In Latin, ūvula means 'little grape', the diminutive form of ūva 'grape' (of unknown origin). A swollen uvula was called "ūva." ^ a b Back, GW; Nadig, S; Uppal, S; Coatesworth, AP (December 2004). "Why do we have a uvula? : literature review and a new theory". Clinical otolaryngology and allied sciences. 29 (6): 689–93. doi:10.1111/j.1365-2273.2004.00886.x. PMID 15533161. ^ "Split Uvula: Is It a Problem?". Retrieved 23 September 2007. ^ Shu, M.D., Jennifer (April 12, 2010). "Will a bifid uvula cause any problems?". CNN. Retrieved 2010-08-07. ^ McMillan, Julia A.; Feigin, Ralph D.; DeAngelis, Catherine; Jones, M. Douglas (2006). Oski's pediatrics: principles & practice (4th ed.). Lippincott Williams & Wilkins. p. 469. ISBN 0-7817-3894-6. ^ "Bifid Uvula and Aortic Aneurysm". Retrieved 12 November 2008. ^ Finkelstein Y, Meshorer A, Talmi Y, Zohar Y, Brenner J, Gal R (1992). "The riddle of the uvula". Otolaryngol Head Neck Surg. 107 (3): 444–50. doi:10.1177/019459989210700318. PMID 1408233. ^ Lehnert, Paul (3 August 2005). "Uvulopalatopharyngoplasty for obstructive sleep apnea". Retrieved 26 October 2006. ^ Biblo LA, Gilbert IA (May 1983). "Aphthous ulcer of the uvula and the painful burp". N. Engl. J. Med. 308 (19): 1168. doi:10.1056/NEJM198305123081922. PMID 6835348. ^ Hartley B, Rowe-Jones J (1994). "Uvulectomy to prevent throat infections". J Laryngol Otol. 108 (1): 65–6. doi:10.1017/s0022215100125873. PMID 8133174. ^ The American Heritage Dictionary of the English Language (4th ed.). Boston: Houghton Mifflin. 2000. p. 1896. ISBN 0618082301. Wikimedia Commons has media related to Palatine uvula.